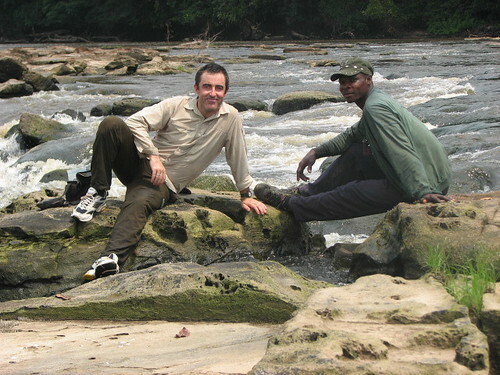 Searching for Bonobo in Congo » In the Dugout, South on the Lomami to the Rapids. Here are a few notes from five days of pushing up-river in our massive motorized dugout. Second day out of Obenge, on the “pirogue” and heading south. I am sitting on the prow swatting flies. These “mouches” are nasty; as I hit one, another stabs. Saw a fisherman today. That was unexpected. 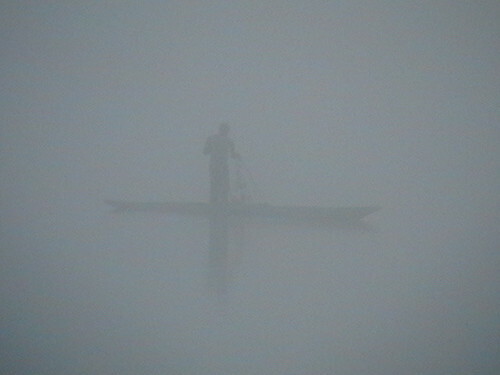 The fisherman had hiked across from the Lualaba River (at least 60 km). He said that there were too many fishermen on the Lualaba. It must be fished out. Thousands of millions of tiny insects were swarming over the river this morning and millions more dead in the water. Very odd. Couldn’t get a good photo, too misty. 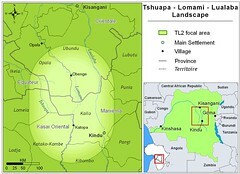 The Lomami is changing a little. Sometimes narrower and occasionally it develops a strong current and we slow right down. Normally we are going 8km/hr, but then we slow to 3km/hr. Just tried to take a picture of all these dead insects in the water but no luck. You cannot see anything. They are white and really tiny. A couple hunters we met along the river explained that there is a path across the forest to the Lualaba and it is clear enough for a bicycle. That means bushmeat from here is feeding the big markets on the other side. You can carry a lot more on a bicycle than on your back. Just went past a patch of rapids. Not difficult to pass but the first we’ve seen so far. About 5 people have diarrhea at the moment, which is making the boat trip interesting! The fisherman we brought along from Opala shat his pants. Poor guy! Not sure what has caused it but think it is probably bad water. When we are in the forest there are streams or even springs – it is much healthier. There’s a little village, we can just see it up river. This is the first for a couple of days. The few people we have seen (mainly hunters) are just here briefly and live at least a day’s walk to the east. Developing a good team now. We got the camp ready in 30 minutes last night. That is from bush to tents up and fire going. Not bad! Every night we play a CD of all the monkey calls. Most of the guys knew a lot of calls but not all that we might hear. Apart from Chryso who has done animal inventories in the eastern parks, all the Congolese guys freak out when they hear the gorillas on the CD. Chryso and I tell them they are actually very gentle animals but they don’t believe us. We are staying in a hunting camp. The hunters said that there are patches of savanna an hour or so walk from here. But, so far, the forest looks and sounds the same. They also said that a bit further downriver is a waterfall. They probably mean rapids. Mainly they hunt with snares here but also some use caliber-12. They get the shotgun shells from Kindu. Today we went past a couple tiny villages and a few old hunting camps. The rapids are really beautiful. Katopa is the village we are staying at just downriver from the rapids. The settlement is real small, probably twenty houses at most but it is on the google earth map. Maybe once, it was bigger? During the night we came to within a few kilometers of Katopa. They heard the outboard motor coming up river and fled into the forest. How odd! Anyway we came on in the morning and all is calm now. When we arrived and they realized we were “safe” the women broke into song. Apparently they were singing “papa has arrived the famine is over”. Expectations are a bit high, I’d say. No school here or medical. The nearest village is 15km away, and it doesn’t have a school or dispensary either. Savanna is only 4 km from here. The chief explained that he has seen Bonobo right out in the grass. 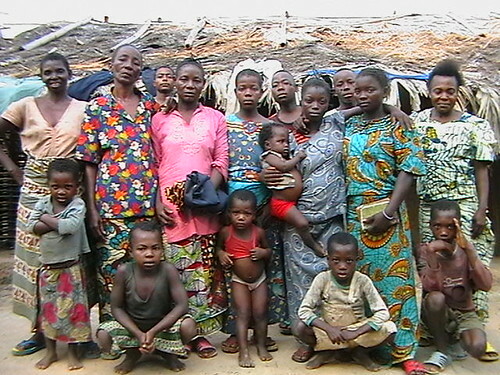 Like all the villages, they hunt bushmeat and hardly fish at all. And, like in Obenge, traders arrive with goods and depart with bushmeat. I’ve seen one transaction already today! Lots of hunting dogs here and lots of children. I always forget, in these isolated places there are hardly any old people. People die young. Have to add this: Just turned on the generator and all the children ran away. They looked really scared. They are still nervous about the lightbulb that came on. Katopa has been isolated for a long time! This entry was written by Terese Hart, posted on 2007-07-23 at 4:12 am, filed under About the project. Bookmark the permalink. Follow any comments here with the RSS feed for this post. Post a comment or leave a trackback: Trackback URL.